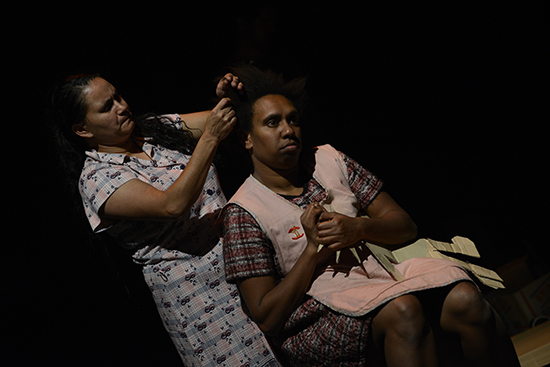 Commissioned by Ilbijerri Theatre in 1993, Jane Harrison’s Stolen is now a classic, studied by many in school and extensively toured, though for me, this production is a first. Mounted by the newly minted National Theatre of Parramatta, directed by the ever inventive dancer/choreographer Vicki Van Hout, the production is clearly attracting an even wider audience. 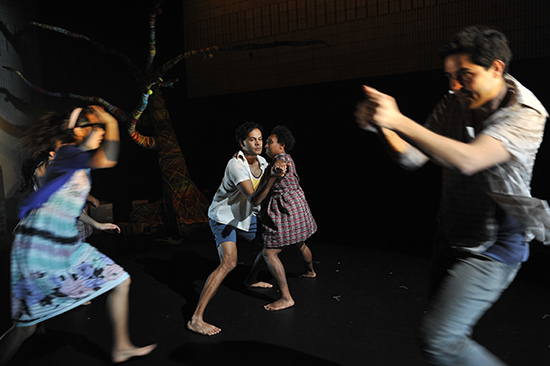 Rather than a stark re-telling of painful history, Stolen is an often playful account of dark times initially seen through the eyes of five Aboriginal children who’ve experienced the dire effects of a government assimilationist policy of enforced removal from their families and institutionalisation. Sandy (Kerri Simpson) is constantly on the move, searching for home. Ruby (Berthalia Selina Reuben) is forced to work as a maid, mistreatment leading her to the edge of madness. Ann (Matilda Brown) is adopted by a white family and forever conflicted. Removed from her parents, Shirley (Henrietta Baird) in turn has her own children removed. Jimmy (Matthew Cooper) suicides when he learns the mother who spent her life looking for him has died before they can be reunited. Van Hout’s production whirls into vivid life as each member of the agile ensemble embodies versions of themselves at different ages as well as other characters, animals and mythic figures. They’re aided in these transformations by design elements created by Imogen Ross and Van Hout. Sheets of cardboard littering the stage are casually folded into objects: a reclining chair, a kennel, a gift package, a cut-out baby. Van Hout describes these objects in her program note as being used “like we would dancing feathers which when finished with are tucked back into the folds of our skirts, to be replaced by leaves or small branches acting as spears or the beaks of cranes, perhaps the motion of the west wind or of the fog rolling off the mountains.” Recalling the wildly idiosyncratic work of the Tjanpi Desert Weavers, a large onstage tree, its branches snaking into the stage space, is yarn-bombed with strands of multi-coloured wool. The swirling shift between character and place is enhanced with tightly executed choreographed sequences. Speech is frequently accompanied by movement: Shirley distractedly snaps her fingers as she speaks; Ruby becomes a lifeless form pushed across the floor on the feet of the others as they spit out the instructions of her oppressors: “Cook for me, Ruby,” “Clean for me, Ruby.” As Sandy tells us how his mother was charged with child neglect by welfare authorities when they discovered an out of date can of peas in her cupboard, he performs a version of that ‘magic three’ shell game involving a cup and a disappearing pea and concludes by angrily kicking the table away. Jimmy, now incarcerated, is a fighter who turns violence on himself and has to be restrained, red gloves peeled from his fists and laid at the foot of the tree. In these and other scenes in the play, memories cut like sharp stones tossed by a whirlwind. 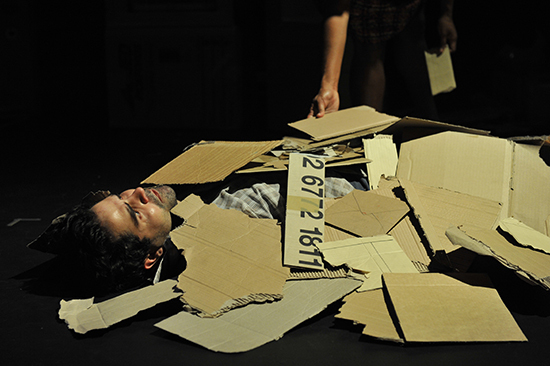 Despite the pace and humour of Van Hout’s production, an overwhelming sense of sad inevitability pervades. Phil Downing’s score adds to the urgency of the telling. On the run again, Sandy’s flight is accompanied by rapid percussion followed first by a sudden flurry, like the wings of a disturbed bird, and then the beat of a train. “Can’t I stay here?” he pleads. Other sequences combine sounds (rooster crows) and words (“Willy, don’t get caught!”). Visual elements in the form of projections are also effective. A domestic blind becomes the page on which Jimmy’s mother writes the letters to her son that he never receives. The indignities suffered by the children intensify as the performers regularly form a line to compare skin colour or fitness to be “chosen” for weekend release or adoption. The threat of “the Welfare” is ever present. Strangely, this is a mantra many white kids of the era will also recall. It’s as if the evils of government policy were seeping through the entire population via its most vulnerable. Ann, ostensibly the most successfully assimilated among the children is also among the saddest. Her sense of identity destroyed, she can find no equilibrium with her Aboriginal family who live, not on the land but in a Housing Commission flat (“I just thought it would be different”) and loses all sense of belonging (“Who do I think I am?”). From time to time, one of the performers sits cross-legged at a small typewriter resting on the roots of the tree. With the echoing of the slowly tapped keys comes a sense that someone, somewhere is getting this all down. Whether in the form of Human Rights reports such as “Bringing Them Home” or plays like Stolen, the truth will be told.